Hello you wonderful Paula’s Plate readers. I apologize for my delay in posts. Once again my computer crashed and landed in the shop for another week. Fail. Hopefully with new software, hard drive and memory, my computer will stop crashing…fingers crossed! Anyway, onto the recipe! I am really excited about these cookies for two primary reasons. 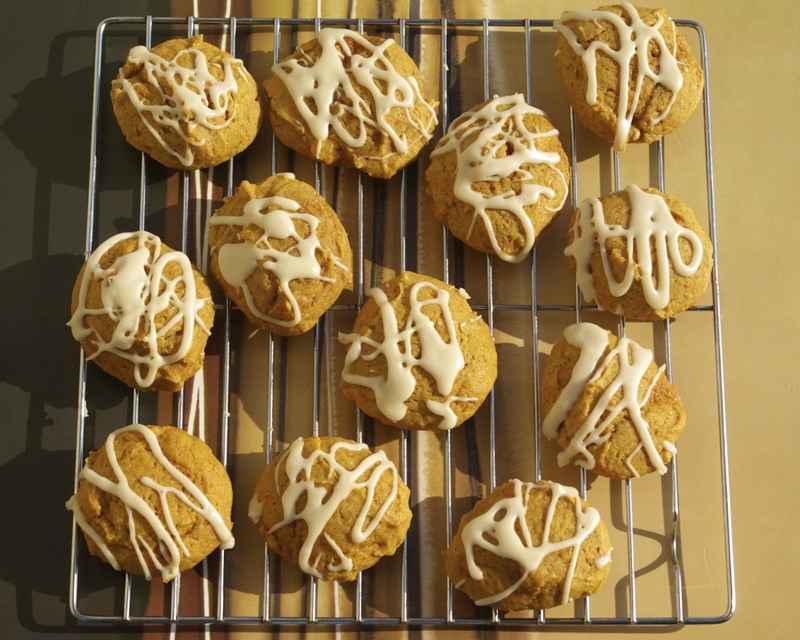 Number one: They incorporate my favorite fall food…Pumpkin! Number two: They. Are. Delicious. If you are a pumpkin skeptic, give this recipe a try. It incorporates the warm flavors of fall in a soft pillowy cookie. Enjoy! In a medium bowl whisk together flour, baking soda, baking powder, cinnamon, nutmeg and salt. In a mixing bowl beat sugar and butter together until light and fluffy. Drop by rounded tablespoon onto parchment lined baking sheets. Bake in preheated oven for 15 to 18 minutes or until edges are firm. Cool on baking sheets for 2 minutes; remove to wire racks to cool completely. Drizzle glaze over cookies and enjoy! Mix together melted butter, sifted powdered sugar, milk, and maple extract until smooth. Be patient, it takes a minute to reach the smooth consistency you are looking for. If glaze remains too thick, add milk 1/2 tsp. at a time until desired consistency is reached. I think I might try these for my in-laws this year. Pumpkin is only served as a savory dish here and when I made them pumpkin pie last year for Thanksgiving they were all confused and couldn't eat it. So I might try these and see if I can convert them to "pumpkin as a dessert."